I am ecstatic about finally having a Mike Horn Ranger in my collection. I have for sure seen and held one in my hand before. The story about Mike Horn is a story about a very tough man with an incredible will for protecting the environment and the earth. In the days to come I will discuss and update this page about this knife and show it. I do not have much special info and the most is already sad on the internet. However there is one particular function that I find very interesting! The main blade is actually a one hand opening locking and serrated blade. 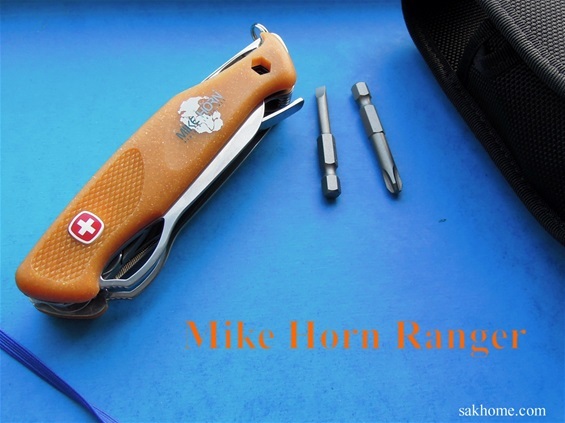 The shape is extra special and it is mentioned on the internet that this is a blade Mike Horn would use for rescue or in a situation of emergency. I find rescue blades and such blades to be one of the most interesting and important functions to have knowledge about. The tip of the blade and the design got a particular name or identification. The name or design shape got a few different ones and I will just go on what it is. The tip is curved/blunt and therefor is can be used to cut free yourself or others from seatbelts, rope or harness. Without puncturing or damage a person or gear. The one hand opening is secure and the locking blade will prevent accidental closing and make the use secure. The serrations are very important on rope, belts or fabrics. Some materials today can be very tough for a plain edge and would require more force when cutting. What is interesting about this blade is that it is more a hybrid and that it will or can be used for more than one task. We know that on SAKs every function can be used for more than one task. A function is from my research made to be as versatile as it can be and one cannot limit a function to only one use. I would expect the same in this special purpose blade or hybrid blade. Probably it can be used by hunters and fishermen for dressing or gutting, actually I am sure it can be used on large fish. The interesting part is that the long blade with one hand opening is without a lock and therefor I would call the locking hybrid blade the “main blade” The combination of these two is a story of its own and I guess it depends on a persons need. The hybrid blade is called an “emergency blade” by Wenger and most of the blade is serrated. This Ranger is going in my collection but I can momentarily see that this blade is a Wenger blade that is superb. I also call this blade the main because it is the first function and at least for a right hand person the easiest function to open. The push button is also here just to release the blade to close. Wenger use a back-spring and a slip-joint type mechanism. This blade cannot be used to pierce or puncture itself. The large plain edge blade can be used for such. The normal way for hunters is to use a sharp tip to puncture and then use the curved blade to gut. For rescue it is just opposite. The advantage with serration is easy to feel on strong rope because you can use a sawing motion with some force for speed. What is also interesting is what influence Mr. Horn has had on the emergency blade. The large blade does not have a lock and rely only on the slip-joint mechanism. The problem with a large blade without a lock is that it would need a very hard spring pressure to be called the main blade. Of course this depends on a persons need or for what task. We know that serrations on materials like wood or to whittle with is not good. The plain edge and the length it got make this a nice tool for food chores. It can be used on wood but one must have in mind the possibility for the blade to close. Make sure the cuts are controlled and that you pull the blade when stuck in a material sideways. It is also a very easy accessible blade for a left handed person. Also have in mind that it is possible to open the blade with one hand from the top. Same on both. What I find is the combination of the long plain edge and the hybrid blade. It is a big bonus to have two sharp edges. It is only good! On the picture above and below you can see the large blade with plain edge. Some prefer a non-locking blade with the slip-joint mechanism. It is like I have explained above that such a large blade should have a lock. This all depends on the use and for sure it is possible to use this blade for many tasks. If you are experienced with knives then it is no problem at all. The emergency blade with serrations got an additional advantage and this is that it will stay sharper for a longer time. Some does not like serrations because it is more difficult to sharpen. If you are experienced it is easy. The combination of two edges are useful, it gives safety. In my research and testing on rescue blades and knives designed for “all use” and emergency I discovered the advantages and dis-advantages with one blade and the combination edge. By this I mean one blade with both serrations and plain edge. Some use the serrated part on the front and some use the serrated part on the inner section of the edge. It is a bit different with the Mike Horn model and for my interest it gives new food for the SAK hobby. The use of two blades is not only interesting it is pure joy. 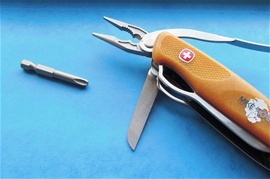 Some rescue knives or special purpose blades got two individual blades with both locking or like on the Victorinox Rescue tool with one locking. There is a big difference between an experienced person and person with little experience. The Mike Horn knife is a bit different because we know it is a knife designed for adventure or use around the world in all kinds of situations and tasks. The emergency blade is for me extra special. The Mike Horn Ranger does not have a wood saw. This is interesting and again from my research and schooling I discovered that the use of two knife blades is very important on a knife without a wood saw. This is obvious because one would need to use the knife edges more and specially the plain edge one. A wood saw is a function that can be very useful. There is also another factor and that is what philosophy the designer and the person got. There is survivalist I have discovered that does not implement using a saw in the nature at all. A wood saw is a function that can make a tool complete. There is also a third factor and that is the philosophy of a knife designed for what I call combination use. By this meaning a tool designed for use on modern equipment and semi-survival use. This is close to an “all use” philosophy. I can state that my knowledge and schooling is self-taught. I have used all kinds of edges and types. I have cut on a huge number of materials. I have even tested one hand opening, edges and locks in a canoe, sit on top kayak and hanging from trees/rocks + more. I do not have special experience in the nature or any such specially. I have military service and special knowledge about tactical philosophies. Then there is a special purpose tool or what I call a third cutting tool on this Ranger. Some call it the Mike Horn awl. You can see on the internet information. This fit very well with my interest and this is that this awl can be used for drilling and hence save the tip of the plain edge knife. It is a very valuable and great function. It can be used in combination with the knife blades. It got an eye for sewing as well. It is a multi-purpose and special purpose function depending on need. There is a forth edge on this Wenger and that is the can opener. Number five is the plier! 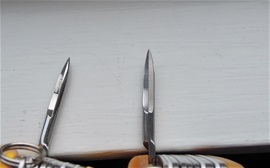 In my Ranger pages and report i have discussed the bit opening used on some Wenger knives. This is used on the Mike Horn as well. This is a pure genius invention and cannot be failed. It is a possibility that makes this special purpose or “all use” depending on need. With the incredible number of different bits made today then this possibility endless. To be called a MultiTool there must be a plier with some size. This Ranger is a MultiTool. The biggest advantage on this Ranger is the metal file/saw, plier and bit opening. The plier got a cutting part and parts for grabbing surfaces. It is a needle nose design. 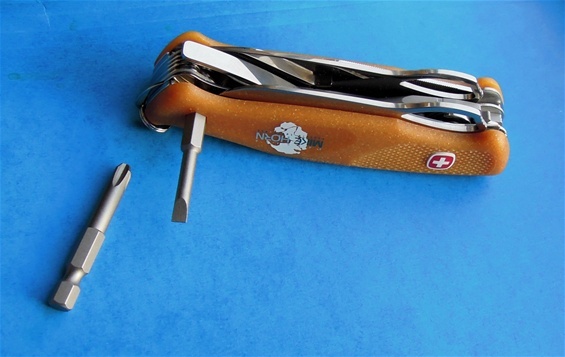 The Plier got an advanced mechanism that makes it possible to fold into the body of the knife and it is easy to open. The metal file with metal saw can be used to cut metal as sad and be valuable in combination with a plier. I would like to mention the bit opening again because this makes this MultiTool much more versatile. You can before hand pick bits that you would need for tasks. I would also mention one more time that each individual function can be used for much more than what the name says. The case or pouch is very good with good possibilities for carry. Not everybody notice the rubber string on the front space. It is possible to carry many bits or additional tools. 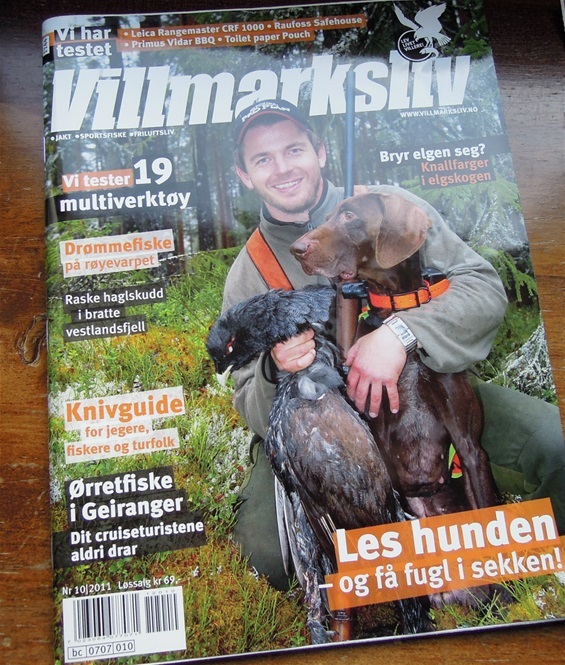 Also take a look at my magazines and test pages. The Mike Horn did it very well! On the picture you can see the difference on the awl or reamer. On the left is the type on the Wenger Ranger Handyman 90. The Mike Horn on the right is a far better tool for drilling. I would expect variations because it would be typical Wenger. In history you can find different awl/reamers and included one that should be close to the left one. I do believe I have seen a type used by Wenger in the 80s. The Mike Horn type i have so far only seen on his. If you got any information on the awl used on the Ranger Handyman 90 please let me know, if this is based on an older shape by Wenger? I know that different materials used on Wenger knives and the Company philosophy is to have an environmental sound image. The handle scales used on the Mike Horn is just superb not only for Wenger but also for Mike Horn. There is much information on the knife on the internet so I do recommend searching the web! The Pangaea expedition you can research and read much about on the web. The Explore Learn Act is important. The logo on the handles is already iconic and worth to research. I remember as a child on school and learning about the continents and how the earth constantly changes. Remember with SAKs that the stamps, emblems and icons on the scales are very important. It is the identity of them.